acres of farmland in the Central Highlands from European to African ownership, coupled with assistance to help make this an economic success for the thousands of settlers and for Kenya as a whole. In the years since leaving Kenya we’ve lost seven of our colleagues: Tom Bruyneel, Larry Eickworth, Tom Giddings, John Grier, Roland Johnson, Dave Kuhn, and Ann Mohan. Confident they would share our conviction of the importance of A Towering Task in telling the history of the Peace Corps, not only to honor the past but also to inspire the future, we have pooled a contribution to aid in the completion of the film. We appreciate the willingness of the film project to post on its website this remembrance of our colleagues’ service. Kenya 1 deplaning in Kenya. Tom Giddings, from Pittsfield, Massachusetts, graduated from Brown University with a B.A. 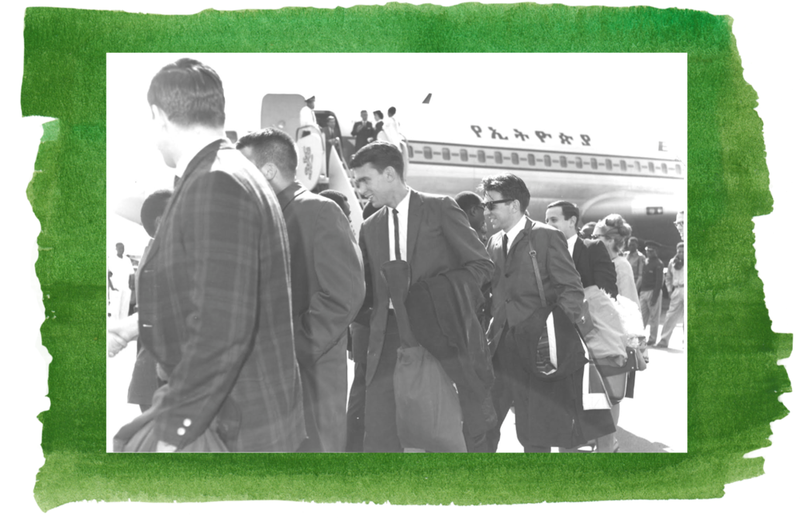 in Political Science in 1963, joining the Peace Corps after a year in law school. Tom was stationed at Ainabkoi, in a complex of low-density schemes (average plot sizes of about 40 acres), on the east side of the road from Nakuru to Eldoret, settled mainly by members of the Tugen and Elgeyo tribes. At about 8000 to 9000 feet above sea level, pyrethrum – from which a natural insecticide is made – was the principal cash crop for export through the Pyrethrum Board of Kenya. As elsewhere in settlement, dairy was a mainstay although in 1965 and 1966 that was affected by a national shortage of dairy cows and dry weather. Roland Johnson, from Cleveland, Ohio, graduated from Lincoln Univer¬sity, Pennsylvania, with a B.A. in Psychology in 1963. Following graduation, he worked for the Peace Corps in Washington, in recruit-ment and selection, soon deciding he should volunteer himself. Roland was stationed in the Lessos Complex, west of but not far from the Ainabkoi Complex where Tom Giddings was stationed. Lessos was settled with members of the Nandi tribe. Maize was a successful crop in Lessos. At 6500 to 8000 feet above sea level, one planning objective for Lessos was tea cultivation. In an oral history, Roland spoke of the challenge of persuading newly settled farmers to grow tea, which had not been part of their experience and for which the timeline of benefit included no return for three years, during which tending was needed. The reward, however, would be productivity for 75 years. In August 1966, at the end of our tour of service, Department of Settlement officials including Director John Maina met with Kenya I to discuss papers that we prepared at their request which described any problems that we had observed in the settlement program and to con-sider our recommendations for improvement. Eighteen of our papers from that conference, and several reports from committees of settlement officials and volunteers, have been preserved and constitute an important part of the history of Kenya I. As George McDowell, the Peace Corps staff member in Nairobi with principal responsibility for the settlement program recalled, “Director Maina expressed a desire to hear from you – the good, the bad, and the ugly – and the group did what was asked.” The paper submitted by Tom and Roland, jointly with Larry Howe a volunteer on a nearby scheme, epitomized the construc¬tive candor that had been requested. A major element of their critique, in reaction to various theoretical assumptions that may have gone into scheme planning, was the need for settlement planners to take greater cognizance of actual circumstances on the ground, such as what the topog¬raphy shows about the most direct route to water, and also to take into account the experiences and views of settlers. Settlers at a settlement scheme meeting. Ann Mohan, from Michigan, graduated from Carleton College, Minnesota, in 1964. Ann and Chuck Mohan were one of three married couples in Kenya I. As Kae Dakin described in her oral history, the Peace Corps “really didn’t know what to do with us,” speaking of the volunteer wives. Ann rose to that challenge, as did Kae and Janet Benson. Chuck and Ann were assigned to work with up to a dozen existing and planned settlement schemes in Western Kenya, spread out over an area roughly 100 miles east to west and 50 to 60 miles north to south, including Abaluhya schemes on the Trans Nzoia and Elgon Masai and Kipsigis schemes on the Cherangani Hills. After an initial period in Eldoret, Hoey’s Bridge (on the road to Kitale) became their base of opera¬tions. As described by Chuck, Ann knew from Peace Corps train-ing that dairying was a key small-holder income source, and soon identi¬fied a need for dairy extension activity, working with the area’s senior Settlement Department staff and the regional cooperative development officer. Ann found that it was best to work first with each scheme’s coopera¬tive committee and the scheme’s dairy staff. They were on the ground full time in each scheme and could more quickly and effectively transmit to individual farmers Ann’s good-dairy practices messages. To motivate cooperative committees, Ann often worked with farmers and their wives in getting their cooperative committees involved in the short-courses she presented at the dairy collection points when farmers brought milk for collection in the early mornings. Ann used posters and visual aids produced by fellow Peace Corps volunteer Jim Cloutier. She brought in Kenya Cooperative Creamery staff to her morning short courses to discuss dairy cleanliness and its relation to farmers’ income. When lack of regular transport to schemes made it difficult for her to cover her large area, Ann figured out how to enhance, from her office, the effective¬ness of the Veterinary Officer. He had been taking slides of dairy cattle blood to Eldoret to analyze for diseases. Ann arranged for the Vet Scouts to bring the blood samples to her to prepare slides, the Veterinary Officer taught her what to look for, Vet Scouts were then able to bring in more samples, and the Veterinary Officer would find the slides prepared, reviewed, and sorted for seriousness when he returned to the settlement office the following day. A meeting on the Kinangops with the Minister of Lands and Settlement, J.H. Againe (in the middle, light gray suit, going over his notes before the meeting started), and the Director of Settlement J.W, Maina (to his right, looking at the photo). John Grier, from Pinehurst, North Carolina, graduated from the University of North Carolina in 1964 with a B.A. in Political Science. John had worked on his father’s farm; in a pamphlet of training program bios, John counted among his interests horse and cow farming. Perhaps because of that interest, John was assigned to the stock farm near Soy in western Kenya where he lived. The stock farm played an important role in the settlement process as new settlers were issued cattle from it. The 1964-1965 report of the Department of Settlement described the North District Stock Farm as follows: “During the year, some 6,700 head of cattle have been issued to settlers from this farm. This entailed holding some 5,000 head on the farm through the drought period, as it was considered that the settlers did not have sufficient keep to maintain these cattle[,]” referring to the shortage of water and forage during the drought. Once the rains resumed, the stock farm issued cattle at the rate of approximately 500 per week. In May or June 1965, John was transferred to the Machakos area, east of and near Nairobi, where settlement had several ranching cooperatives, before returning home in 1966. A brother and sister on Kipipiri. The little girl holds a notebook with her school writing exercises, which was very important to her. Tom Bruyneel, from Riverside, California, graduated from San Diego State College in 1964 with a B.A. in Political Science. Tom was assigned to Lietego, a low-density 1700 acres scheme with 54 plots that averaged 30 acres each. He was then also given responsibility for Manga, a larger 7000-acre higher density scheme with over 300 plots averaging 19 acres. The two schemes were located at 6,000 to 7,000 feet above sea level and were settled by members of the Kisii tribe. Dairy and pyrethrum were mainstays of the farm economy at Lietego and Manga, with passion fruit and tea being added. The 1965-66 annual re¬port of the Department of Settlement credited both schemes with “main¬taining good standards.” In an oral history, Tom recalled that the smaller size of Lietego enabled him to develop regular connections with individual farmers in a way he could not do on the larger Manga scheme, a challenge often faced on larger schemes. In his oral history, Tom recounted a joint undertaking with Bill Stirling and Ivar Nelson, also of Kenya I, who worked on a neighboring scheme settled by members of the Kipsigis tribe. Tom described the bor¬der between the schemes as literally a tribal border that would be crossed to fight and steal cattle. The Peace Corps volunteers on the two sides of this tribal boundary developed the idea of an auction, that would occur literally at the border, where members of the two tribes could come to buy and sell rather than steal. It worked. Out of that came the idea of a joint school. While that didn’t come into being before Kenya I’s tour ended, nonetheless the idea had been planted. Lorance (“Ike” to his friends) Eickworth, from Coos Bay, Oregon, graduated from Oregon State University in 1964 with a B.S. in Business and Technology. In 1965, Ike was stationed at one or several settle-ment schemes, including Ol Jaro Orok a little south of Thomson’s Falls, an area of Kikuyu settlement. Ol Jaro Orok West was one of the large high density schemes in that part of Kenya: 10,000 acres, 510 plots averaging 16.7 acres, with a farm economy based on pyrethrum, butter¬fat, potatoes, and sheep. In 1966, Ike was assigned to the Ol Kalou Salient, also in the Thomson’s Falls area. The Salient posed special challenges. Two thousand families had occupied it but the land was not suitable for division into individual plots. Volunteers were tasked with assisting Kenya officials to transition the area to producer cooperatives that would utilize farm equipment for large-scale operations. There was a need to maintain that equipment and provide permanent housing for families then living in squatter villages. Ike supported several of the 20 cooperative farms that had been established in 1965, helping to get people established in their new homes and to join the workforce of the cooperatives. His business education was put to use. To that end, “[a]fter much enquiry of old-timers,” Dave designed a project to build, using a rammed earth technique, a set of dura¬ble yet inexpensive model buildings. Expenses for the model homes were met by a $5000 grant from an Ambassador’s Fund operated by the U.S. Agency for International Development, applied for by fellow Peace Corps Volunteer, John Riggan, an example of volunteers and programs (Peace Corps and USAID) working together. Working with Kenyan mechanics, Dave also had responsibility for the motor pool at which farm machinery was maintained for the highly mechanized operations on the Ol Kalou Salient. Thank you for supporting independent filmmaking!